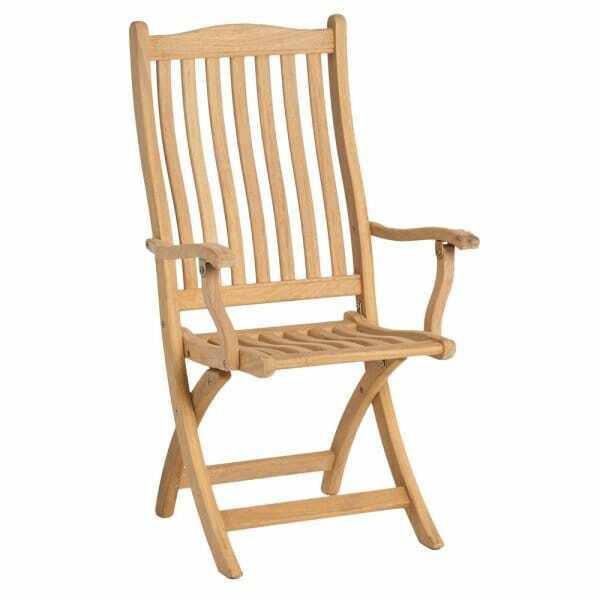 Alexander Rose Roble Folding Carver Chair;This Alexander Rose Roble Folding Carver Chair is a perfect chair to team up with any of the Alexander Rose Roble pieces of furniture and will be ideal as 'head' chairs for your dining set. The chair offers supportive backs that will provide comfort and the armrests allow the user to sit back after dining, rest and let dinner settle. The hardwood used for the Alexander Rose Roble Folding Carver Chair is a mellow yellow and has been smoothed for a sleek finish. Compact and easy to fold when the winter months come around and you need to store your dining set. The Roble timber originates from Bolivia and is FSC certified and is a really strong wood that is perfect for garden furniture.